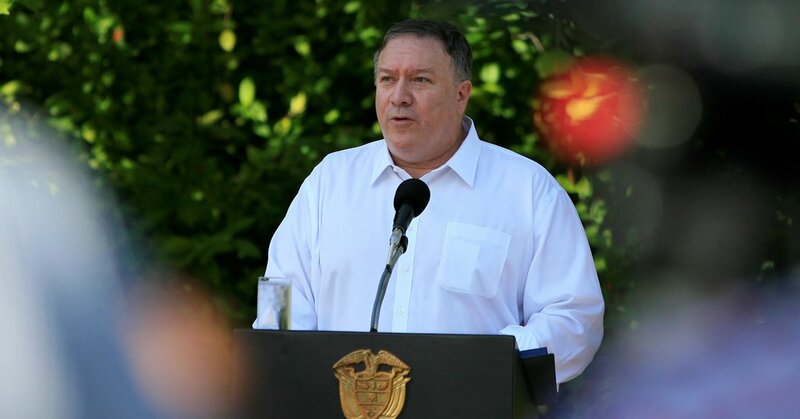 WASHINGTON — Secretary of State Mike Pompeo warned Iran on Thursday against launching three spacecraft in the coming months, describing them as a cover for testing technology that is necessary to lob a warhead at the United States and other nations around the world. The stark warning on Thursday was immediately rejected by Foreign Minister Mohammad Javad Zarif of Iran, who shot back in a tweet that Tehran’s launch of space vehicles — and of missiles — is “NOT in violation of Res 2231.” He was referring to the United Nations resolutions approved in 2015, shortly after the completion of the Iran nuclear deal. The hostile exchanges may foreshadow the tensions between the two countries over the next year. Mr. Pompeo has vowed to counter Iran in the Persian Gulf, and outlined a dozen demands that he says Tehran must meet if it wants an end to sanctions and readmittance to world financial markets. Both countries may see a political advantage in increasing tensions. Iranian critics of President Hassan Rouhani and Mr. Zarif, the architects of the 2015 nuclear agreement, argue that they accomplished nothing by rolling back the country’s nuclear program, since Mr. Trump reimposed sanctions. Nonetheless, Iran has stayed in technical compliance with the accord struck with world powers during the Obama administration. In Washington, with the loss of the Republican majority in the House of Representatives, many of Mr. Trump’s aides and supporters have privately acknowledged that his domestic agenda is likely to be largely frozen. As Mr. Trump turns even more strongly toward national security issues that rally his base of supporters, Iran is a natural target. A Dec. 1 ballistic missile test led to more international condemnations of Iran, and Mr. Pompeo’s statement on Thursday seemed intended to declare that a space mission is merely cover for a missile test. Russia launched Iran’s first satellite in 2005. Tehran began launching its own satellites in 2009, joining an elite club of nations that have used their own technologies to send objects into orbit. At the time, the State Department called the 2009 launch a matter of “great concern” that was potentially in violation of United Nations agreements that limit Iran’s missile activities. Iran followed its 2009 success with satellite launchings in 2011, 2012 and 2015. The last of those was a small experimental satellite weighing a little more than 100 pounds, but that burned up in a fiery re-entry in late February 2015. Western experts worry that space launchings can act as technology tests for the development of ballistic missiles that can hurl warheads around the globe. It appears, since then, that Iran has lofted no satellites, even while keeping up its rocket development work. In July 2017, Tehran fired a new generation of rocket, named Simorgh, or Phoenix, designed to loft payloads weighing up to about 500 pounds. The State Department spokeswoman, Heather Nauert, at the time called the launching a “provocative act” that violated the spirit of the 2015 nuclear accord. Early last year, Iran’s minister of communication and information technology said Tehran was making final preparations for the launching of four satellites into space. But Iran has lofted no known satellites since the 2015 deal, even while developing and testing what experts call new generations of increasingly powerful rockets.